Claire A. Warden (b. Montreal, Quebec) is an artist working in Phoenix, Arizona. She received her BFA in Photography and BA in Art History from Arizona State University. Claire’s work has been exhibited widely in the United States and abroad. She has been named LensCulture's Top 50 Emerging Talents, Photo Boite’s 30 Under 30 Women Photographers, and a Critical Mass finalist. In 2017, she received an Artist Research and Development Grant from the Arizona Commission on the Arts and the Ed Friedman Award from the Griffin Museum of Photography. Her work has been featured in various publications, including Real Simple magazine, The HAND Magazine, Common Ground Journal, Prism Magazine, and Diffusion Magazine. Claire was awarded artist residencies through the Alfred and Trafford Klots International Program for Artists in France, Art Intersection, the Center for Photography at Woodstock and a forthcoming residency at LATITUDE in Chicago. Mimesis is grounded in issues of identity, the other and the psychology of knowledge and power. The creation of this series comes at a time when the struggle to accept the unfamiliar is pervasive in our culture. When looking at these images, the urge to ask “what is it?” echoes the question, “what are you?” – a question that has been directed towards me countless times in regards to my physical likeness as a person of color and one that I find increasingly difficult to answer. Raised in a family with a diverse ethnic background has led me to reflect on the fluid, abstract nature of identity, which informs my use of photography. 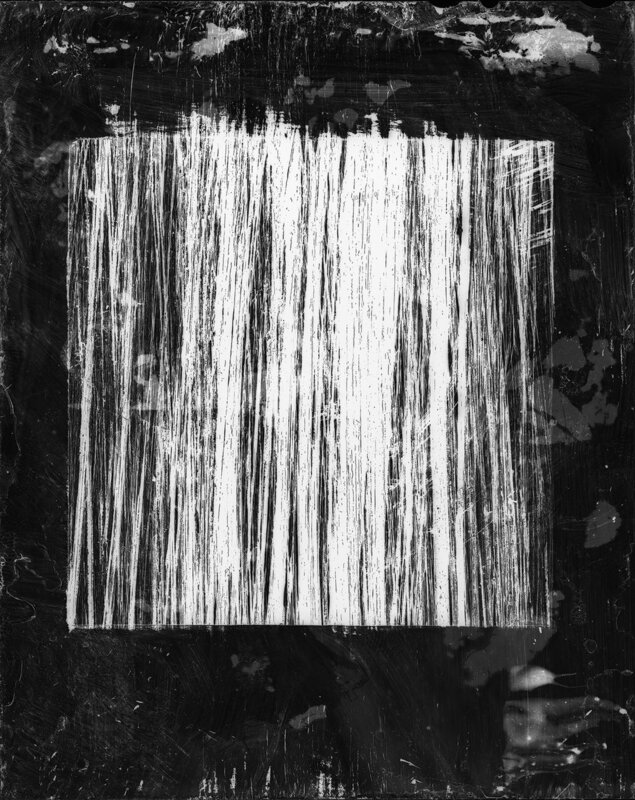 I use a cameraless photographic process, which incorporates saliva and mark-making that I find uniquely qualified to address the biologic and socio-cultural forces that stimulate the emergence of an identity. This process produces a series of images that reveal certain truths in my experiences surrounding identity and simultaneously the inadequacies of language to describe oneself. Resembling systems of the natural sciences—microscopic, topographic and celestial—the photographs allegorize the complexity of systems that make up an individual and the perception of self. When and where did Mimesis begin? 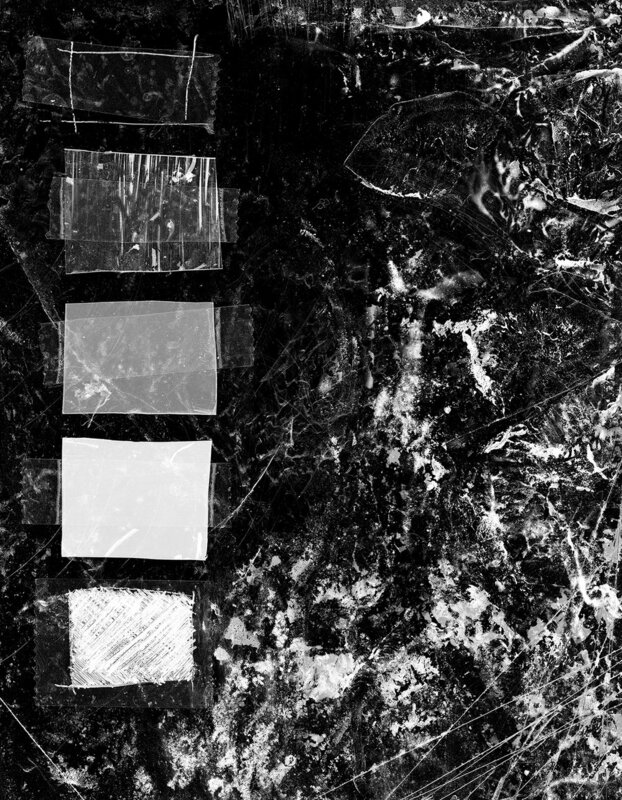 Mimesis began as a series of experiments, in which I was exploring the limits of what a photograph was or could be, for me—how far I could push it. Simultaneously I was considering the question, “What are you?” This is a question I started being asked after I moved to the United States from Montreal. Because I was predominately a French speaker, I was convinced this question was a translation error on my part. But as the question persisted, I realized this is a coded way of asking about my ethnic background. I wanted to make work that could visually address this question and how these experiences, sometimes abrupt and confrontational, as an immigrant and person of mixed ethnic heritage have shaped my own perceptions and identity. 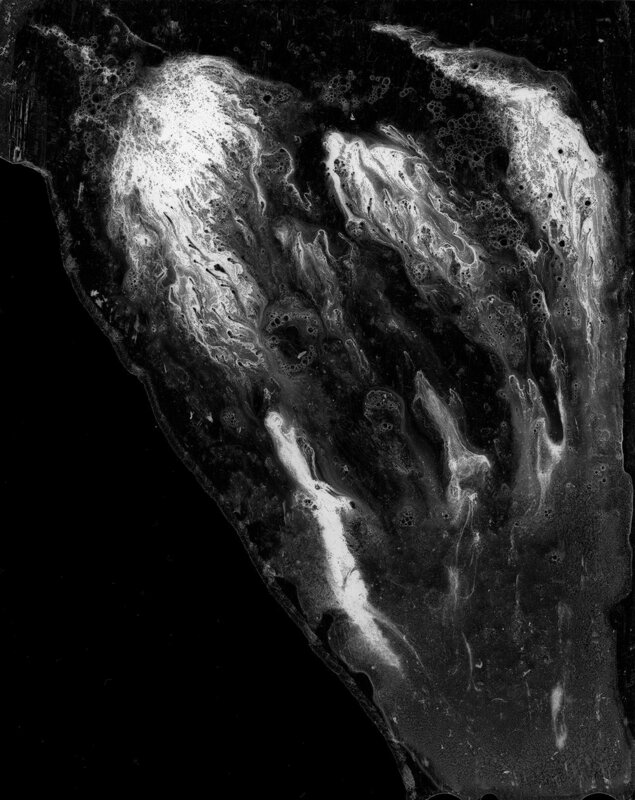 I applied saliva to the emulsion of photographic film and once I realized the possibilities of this process, the series became clear. Saliva contains digestive enzymes, among other things like DNA, and the gelatin of black and white photographic film is digestible. Once that process has etched through the film emulsion, only biologic matter and metallic silver remain. 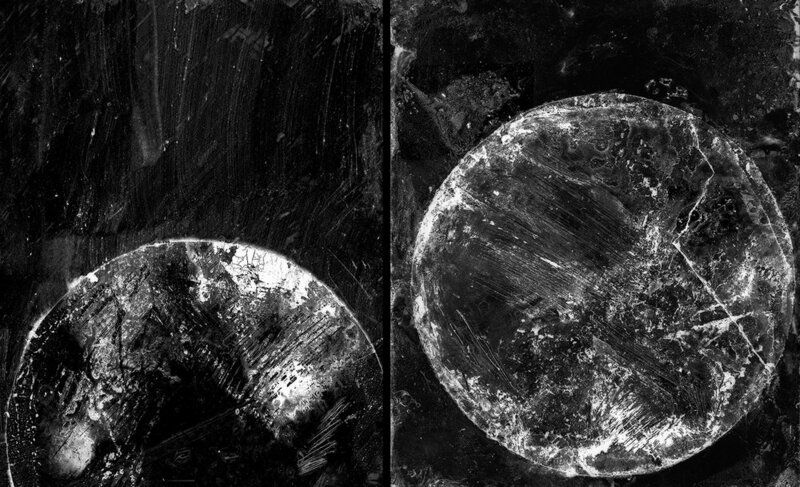 After this process is complete, I use mark-making tools to create informed symbols and shapes by physically adding to or removing from the film negative. This additive/subtractive process was established early on in reference to the term impression management, which is used to describe the way people try to manage other people’s impressions of them. My mark-making is inspired by personal or collective experiences and sociological ideas. Together, this process became uniquely qualified to address my questions about identity. Mimesis is an ongoing series. To date, I have around 20 negatives in various stages of completion—some that I’ve just started and others that I need to revisit. 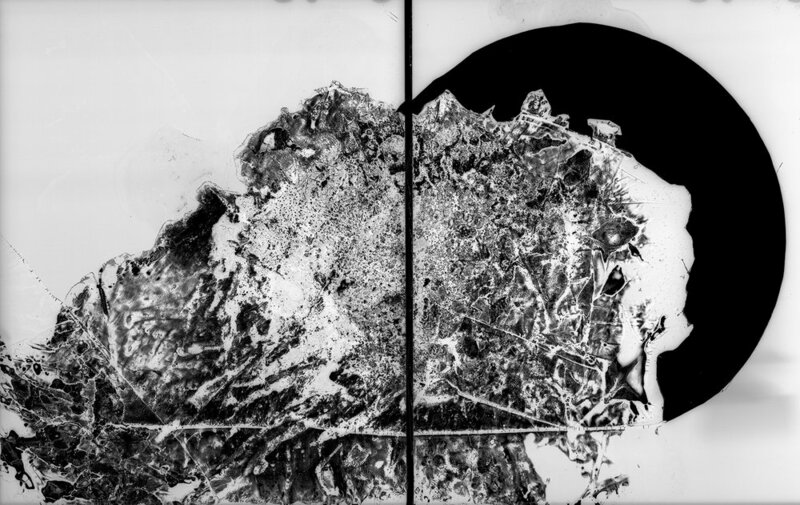 Since these works are cameraless and created in my studio, I have the unique opportunity to extend the process of creating a negative from something that is relatively finite to something infinite. I can go back to work on a negative endlessly until I know that it is finished. The pieces from the series have been shown in exhibitions nationally and abroad, with a bulk of my solo exhibitions in the western states. I currently have an exhibition on view at the Arizona Community Foundation in Phoenix until March 10, 2018. I really think having an exhibition of this series is an ideal way for people to experience it not only because of the large scale of the work but also because of the dialogue I can initiate with visitors. Making new work for my current series can take a very long time—from about a month to over a year—as a result of the process. Between creating new works, conducting visual and intellectual research is essential to the progress of new pieces as well as setting goals each week to do something productive for my art practice or promoting the series. Broadly, this includes research, sketching, reading, applying for exhibitions, grants and artist residencies, updating my website, and occasionally sending a newsletter or participating in portfolio reviews. I think it is also important to remain active in your local art community, even if that just means showing up to local art openings. The Phoenix area has great museums and an energetic art scene. I have always made a point to maintain work that is fulfilling and inspiring, not creatively draining. For me, that has meant working in museums and in classrooms. For a time after my undergraduate, I was working at the Getty Museum in Los Angeles—photographing the permanent collection—and I currently work at the Scottsdale Museum of Contemporary Art as a collections photographer. I am concurrently teaching photography at an arts high school. I am fortunate to be surrounded by people who love art everyday and that is incredibly inspiring. For the series, I will be focusing on the completion and production of new works in the next year. I have an upcoming Artist Residency at LATITUDE in Chicago this summer. And I will be releasing a limited edition print in the New Year to support my time at the residency – stay tuned! I will also be teaching a wet plate workshop with talented artist David Emitt Adams in Tuscany, Italy this June 2018. This will be our second time teaching this 8-day workshop and it is truly a life-changing experience and emersion in photography, art practice, discussion and incredible food. If you want more information about it, head over to Alchemy Studio here.